This past Saturday, we celebrated the furriest member of our family turning 5! We can't believe our sweet Jenny is already 5. We adopted her when she was just 6 months old... where has the time gone? To celebrate, we decided to go on a big hike as a family. There are few things Jenny loves more in this world than hunting and nature, so we knew this Jenny-centric event would be a hit with her. 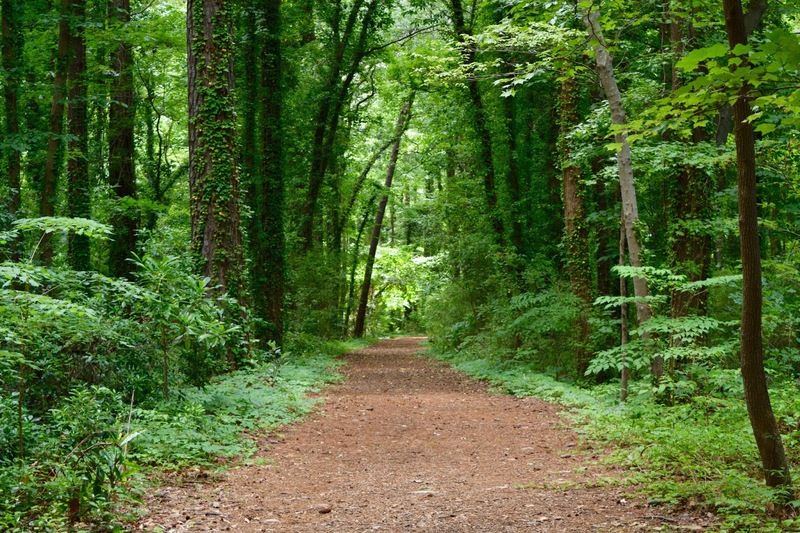 When I say hike, I really mean a nature walk. We try to find the most remote-looking area and go on a long walk together. Regardless of semantics, the first thing we did was head to CVS pharmacy to stock up on our hiking essentials. Once our backpack was packed, it was hiking time! 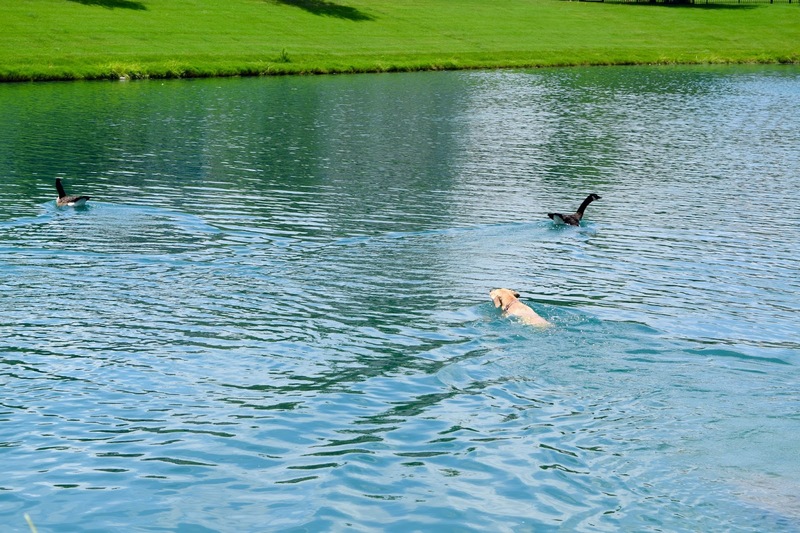 We started the big birthday hike with a little swim in the pond to chase the ducks. We would never let Jenny chase a duck on land for fear that she might catch them, but in the water, our pup doesn't stand a chance, so we let her go for it. 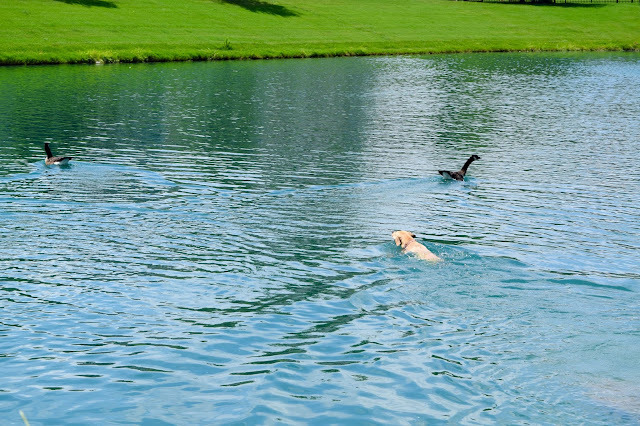 She always jumps right in and starts swimming for the duck, and about 15 seconds later realizes she isn't going to catch it and turns back around. 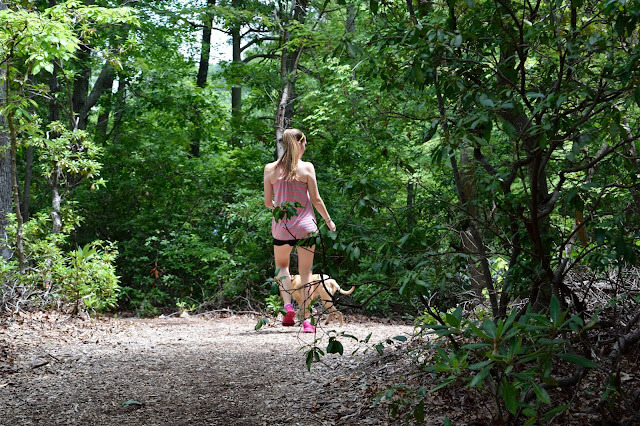 We toweled Jenny off, packed our little hiking backpack, and took off into the woods. It was so. darn. beautiful! Everything was so green, there was a nice breeze, and the mosquitoes didn't eat us up. Perfection. Seriously breathtaking. 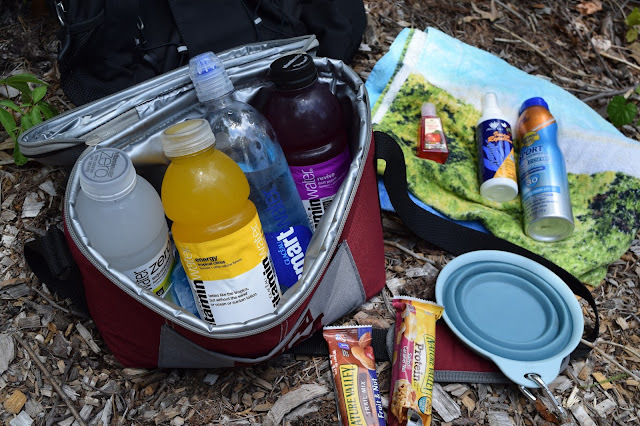 Since family hiking is one of our favorite past times, I thought I'd share what we keep in our backpack for each hike. These are the tried and true items we've realized we need through trial and error. 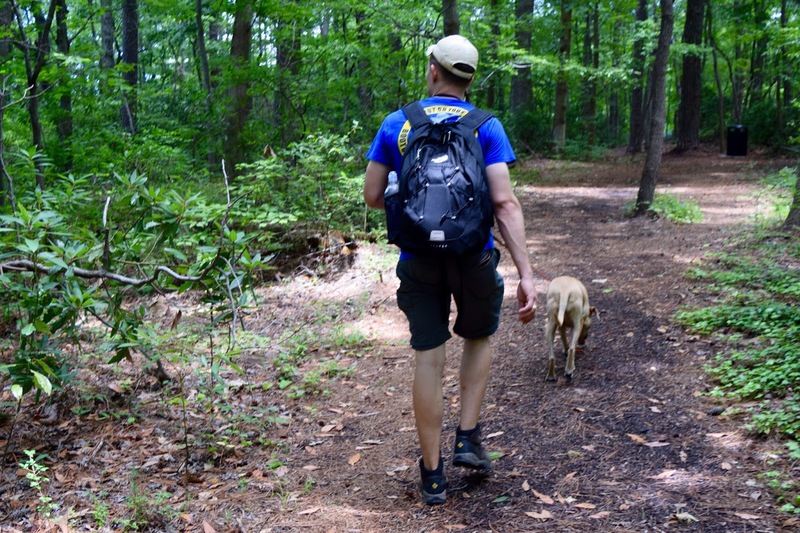 After 4 years of family hikes, we finally have it down to an exact science. A lot of these items are found at our local CVS pharmacy, so we do some one stop shopping at its finest. 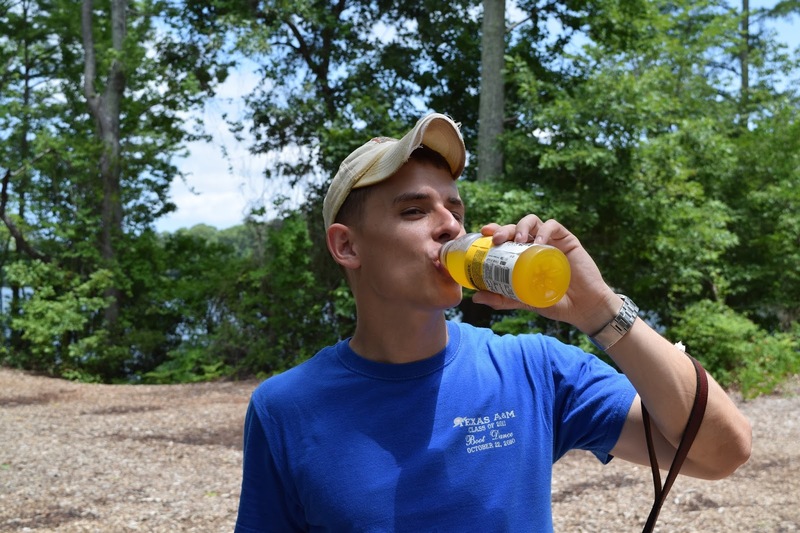 The most important aspect of hiking is hydration. 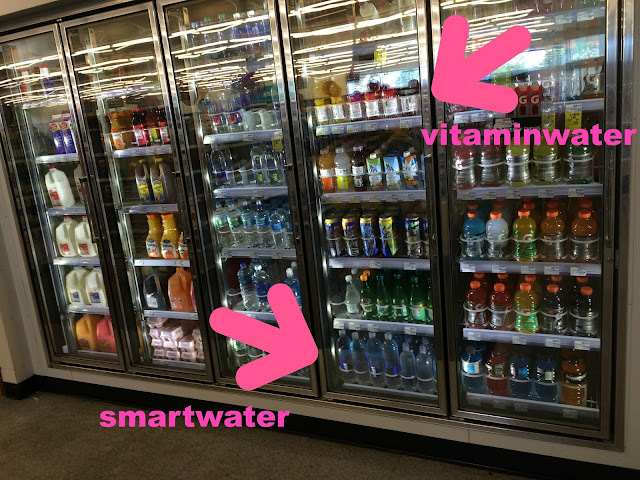 We keep our mini cooler stocked with smartwater and vitaminwater to make sure we are hydrated and energized for the day's activities. Since the area we hike is shaded, it's easy to forget to be drinking, but it's so easy to get dehydrated if you aren't careful. I'm a big water girl so the smartwater is my go-to, and Parker likes the vitaminwater for flavor. We also throw in a couple of granola bars in case we get hungry, sunscreen, insect repellent, hand sanitizer, and a towel and pop-up water bottle for our little duck chaser. We poured some smartwater into Jenny's bowl (pups have to stay hydrated too! ), and that quickly became her water bottle. She decided it was easier to just drink out of the water bottle rather than the bowl, apparently. Cute? Yes. Gross? A little. We had so much fun as a family celebrating our furball. Adopting Jenny was the best spontaneous decision we have ever made. She gives us so much unconditional love and brings us so much joy. 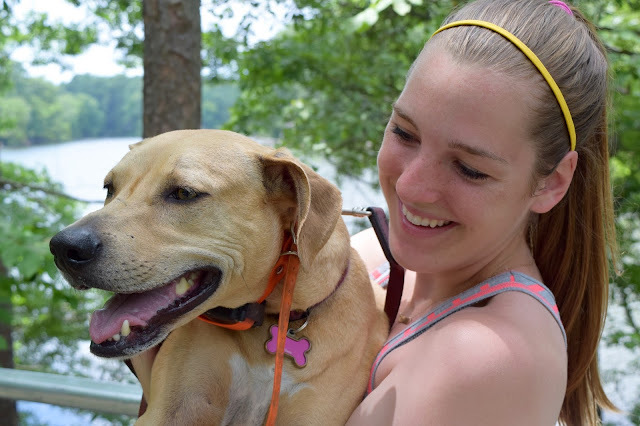 We try to get all of our friends to adopt dogs because they just make life better. We love our girl! Happy Birthday Jenny! 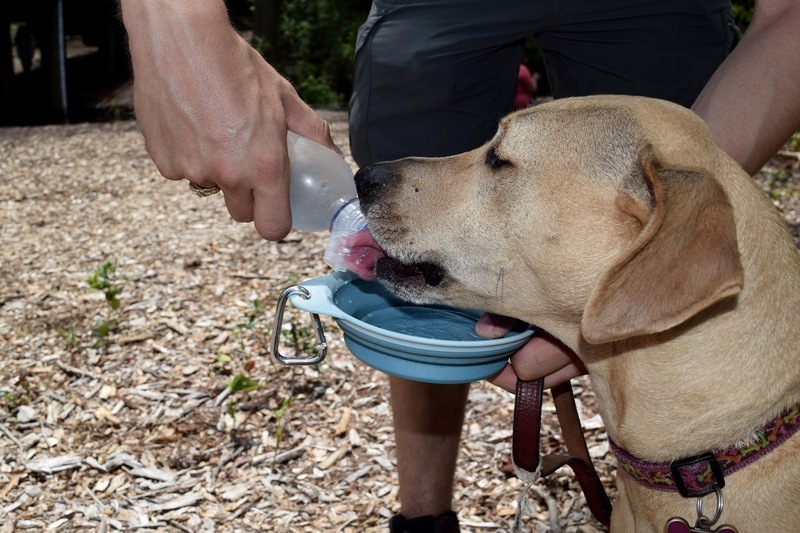 I bring a separate water bottle for the dogs when we go on ours and just squirt it in their mouth. We love family hikes too!